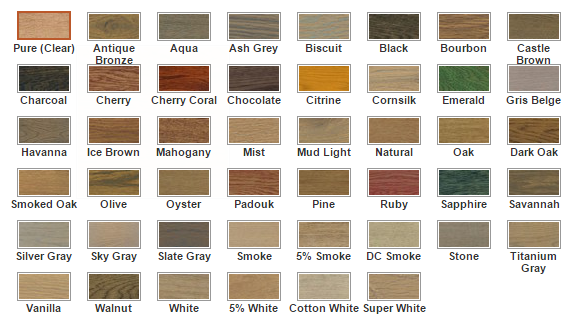 Transform your home with these standard and custom made oak stain colors. Sample or Price? Contact Us! Are you looking for a natural floor finish that you can enjoy as soon as your floor refinishing project is completed? We've put together a list of products that are as green as they come. 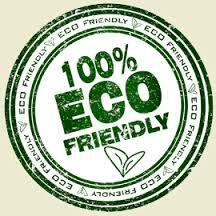 They are guaranteed to be either 100% natural or, for others, have barely any VOC content in them. If you want a floor finish that's 100% natural, with no chemicals whatsoever, Monocoat is the finish you are looking for, guaranteed. Originaly started in Belgium, this product is catching on, slowly, here in the States as well. Made out of natural products only, this amazing plant based floor finishrepresents a huge step forward in the floor refinishing business.. 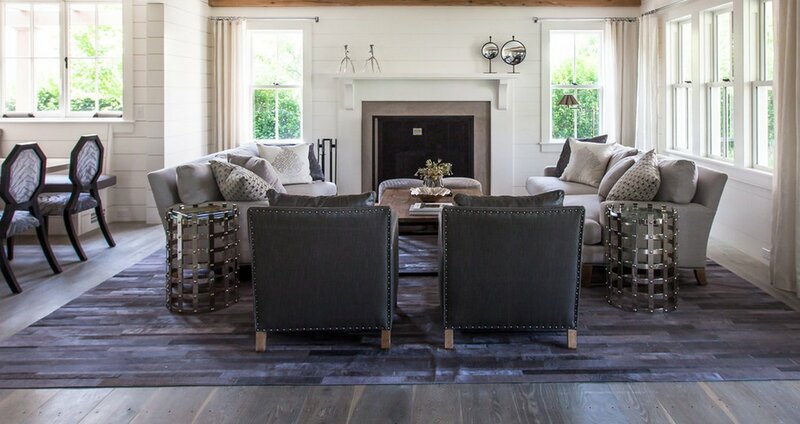 So, what are the advantages of using Monocoat during your next flooring project? With fourty six different stain colors to chose from this, one of its kind, natural floor finish offers almost twice as many colors as its known competitor Duraseal or Minwax and, believe it or not, almost four times as many stain colors as Glitsa. More so, if you'll take a look at any of these guys, they only offer variations of red and brown, with white and black being at the extremes of their spectrums. Monocoat, on the other hand offers almost any floor stain you can wish for. Do you want a blue floor, you got it. Is green on your favorite color list? They have it. Silver, red, beige or gray? 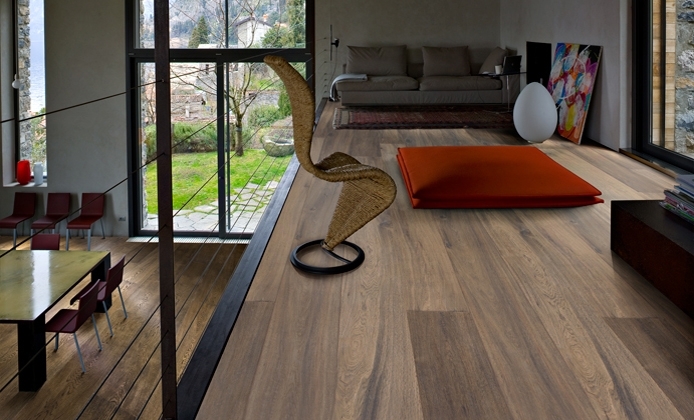 Whatever it is that you're looking floor, this natural floor finish is guaranteed to meet and exceed your expectations. Do you feel like fourty six different stains are not enough for you? Take a look at the other eitghty four creative accents you can obtain, by mixing their stains with the fourteen precolor easy, unique shades. And, if you think this is it, we didn't even tell you about the multitude of colors you can obtain by simply mixing any two of their original colors. So, to put it simply, when it comes to stain colors, with Monocoat, the sky is truly the limit. But, are there any other benefits aside from the multitude of colors? Ok, ok... maybe Monocoat won't make your neighbours love you, but I can guarantee you that, if you live in a condominium building and decide to use a swedish finish or a high VOC polyurethane floor finish your neighbours are gonna hate you. These floor finishes smell so bad, and are so loaded of chemicals, not long ago I had a client calling, asking us to resand their newly refinished wood floor because two weeks after the project was completed, they still couldn't move in. More so, when they decided to have someone come in and check the air quality in their home, the results were frightening: seven times over the normal VOC content. So, going back to my original point, Monocoat fumes are almost non-existentand the very little scent emanated by this natural product, is actually quite pleasant. So, while your neighbours might not love you more, after using Monocoat, they are guaranteed to like you at least as much as they used to. Unlike all the other floor finishes, that create a film on top of your floor, Monocoat is a penetrating floor finish which makes it very easy to repair and touch up. Let me explain, shortly. Top finishes, whenever are being scratched, require expert sanding in order to fix and repair. More so, even for the best of us, doing a touch up on a dark stain, with a top finish like polyurethane, water-based or swedish finish, it's never an easy task. 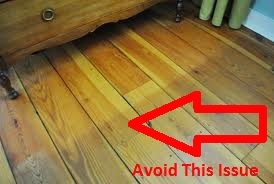 To put it in layman's terms, spot sanding for a touch up, creates a gauge in your floor finish, which will need an extensive amount of work in order to complete in a somewhat decent manner and, almost always there are going to be overlaps, which will be quite obvious, especially to the trained eye. And once you deal with a stain color, the darker it is, the more obvious the touch up area is going to be. Rubio solved this problem 100%, by creating a product that doesn't create a top film, but penetrates the wood floor and bonds with the first microns of the wood. This allows for the damaged area to be lightly sanded and stained without virtualy any overlaps or indications that a repair of the area was done. No flooring contractors needed, completely doable by you, yourself or anyone else, for that matter. As the name suggests, Monocoat is a one time application type of finish. The molecular bonding technology behind it, allows the first coat to adhere to the micrones of the wood floor after which not only is it not required to apply another coat but, even if you try to do so, you won't be able to. 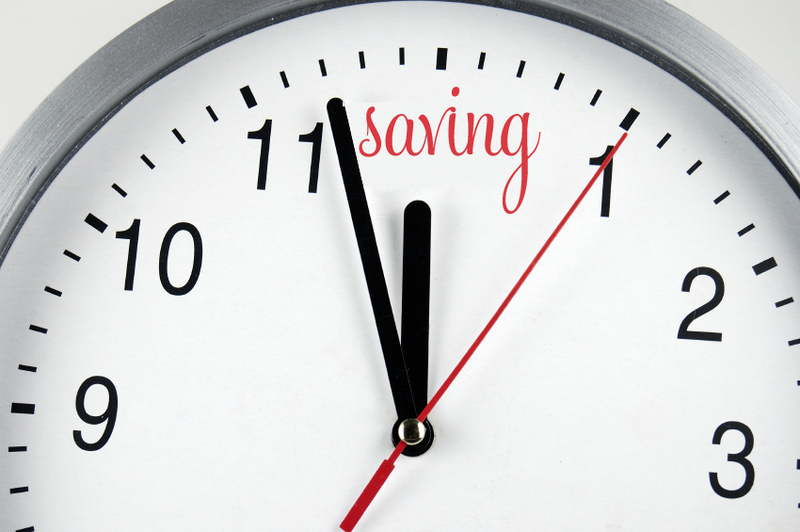 Being a one coat floor finish, evidently, will save you a lot of time on your flooring project. To put things in the proper perspective, a wooden floor stained with a Minwax stain color and finished with an oil based polyurethane, will require four days just for the finishing part. On the other hand, Monocoat requires one single day for finishing. So, faster move back in for you and your family. One of the most commons problems with top floor finishes is peeling or flaking either immediately after the completion of the project or whithin six months to a year. These type of problems are usually due to improper application of the finish, not allowing the stain to dry long enough, not allowing the floor finish to dry properly between coats etc. Whatever the reasons might be, they happen often in this business filled with contractors willing to cut corners, just to maximize some profits. 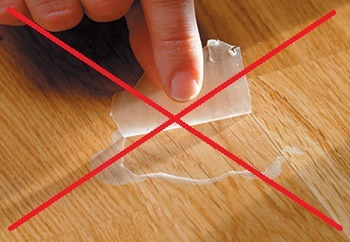 However, with Monocoat, Peeling or Flaking is not possible for the same reasons described above. 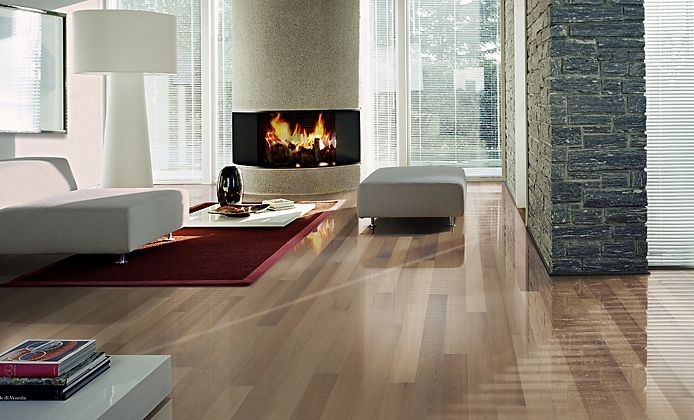 By applying one coat only, that penetrates your wood floor, there is no other coat to react to or not bond to. 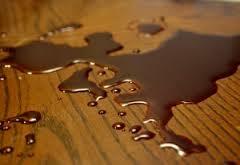 Another big issue with floor finishes is spill resistance and overall strenght of the floor finish. There are so many cheap options available on the market and, in the begining, there is hardly any difference between a high quality product and a cheap replica. Needless to say that, there are plenty of unscrupulous flooring contractors willing to use this to their advantage and ready to offer you what seems to be a great deal, at the moment. 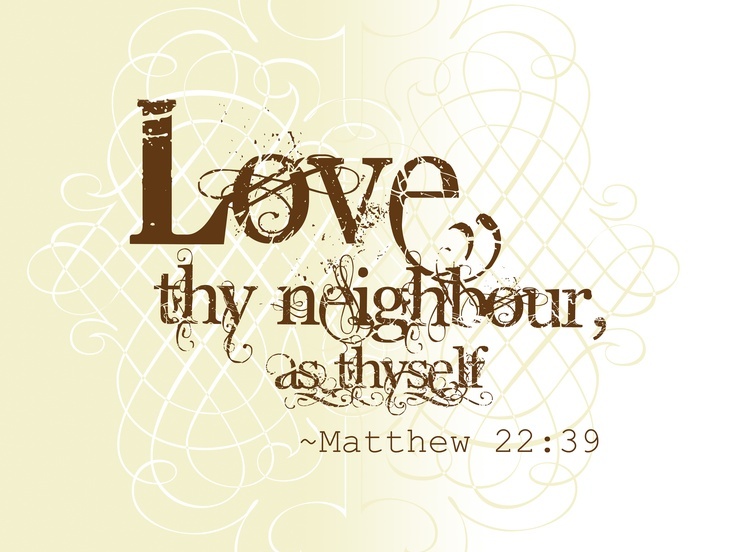 However, in the long run, the difference is obvious. Most low quality floor finishes, will show their true colors within six months to two years, especially in the high traffic areas. By then, your floor refinishing contractor is long gone, his check is already cashed and you are left to deal with the problem. As for spills, if I had a hundred dollars for every call I got in regards to a floor damage caused by a minor spill, I could live on an island somewhere. 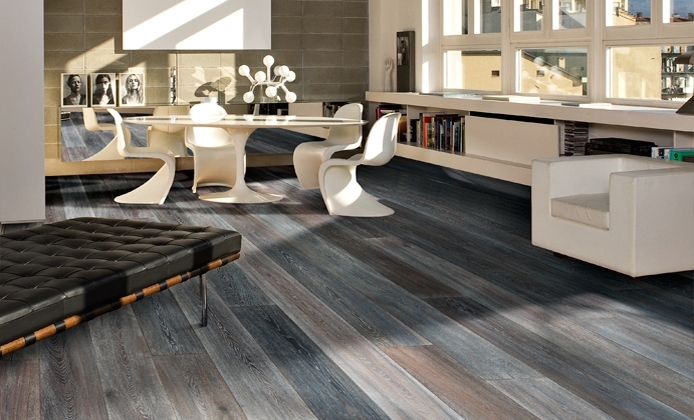 Monocoat, on the other hand, will not do this to your wood floor. As explained before, the finish literally bonds with your wood floor molecules leaving a long lasting, matte, protective coating, that is guaranteed to not peel, crack or show any other problems, typical to top floor finishes. Spill wise, it's been tested against the strongest wood attackers you can imagine, and the results have been more than impressive. 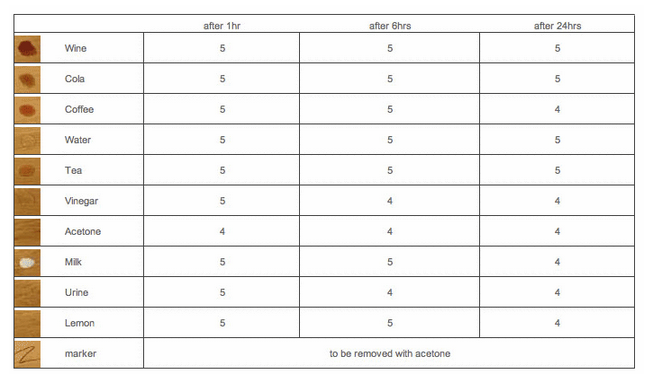 Take a look above and see the results on a 24 hrs period, with grades from 1 to 5, with 1 meaning "complete damage or peel off" and 5 meaning "no visible damage". Fading floor finishes, as well as yellowing are probably the most common problem homeowners have to deal with. The worst of them all, in this regard, is polyurethane. Rubio claims that the vegetable oils used in this floor finish are non-yellowing. While the relative short amount of time we've been using them for (a couple years only), is not relevant one way or the other, so far, we didn't get any complaints from customers that ordered it, so we take this as a great sign. Did I Mention It Is Completely Green? 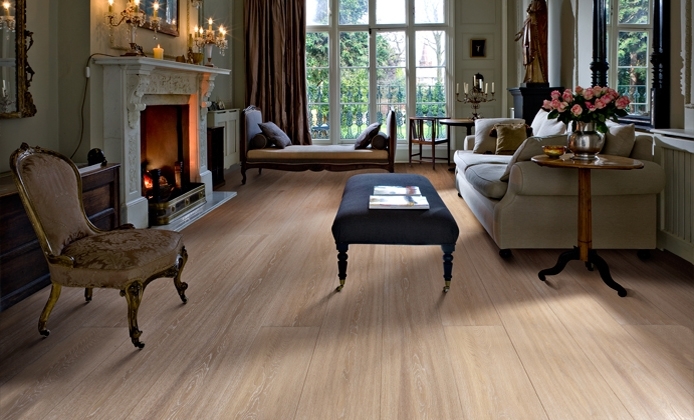 Yes, one of the main reasons most people choose this natural floor finish is it's VOC content. ZERO! A short list of what's in it, as well as what's not in it, will turn any skeptical person into a believer, when it comes to the cleanliness of this floor finish. Ok, Ok, but what's in it, than? 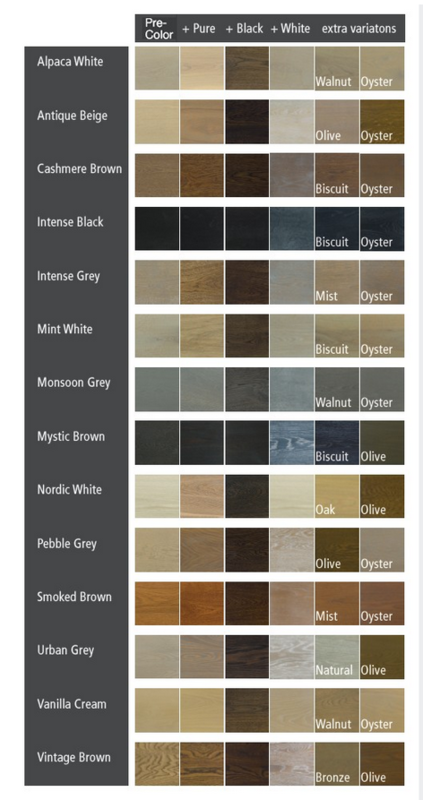 So, Is Rubio Monocoat the Right Floor Finish for Your Home? As much as we'd like to answer this question here, the best way for you to find out is, if us or another experienced flooring contractor takes a look at it. If you are in the Chicago land area, and yes, that includes the Chicago Suburbs, contact me and I'll be more that happy to assist you in choosing the right floor for your home. If however you are somewhere else in the States, give these guys a try, they might be able to find you just the right hardwood contractor for your project. 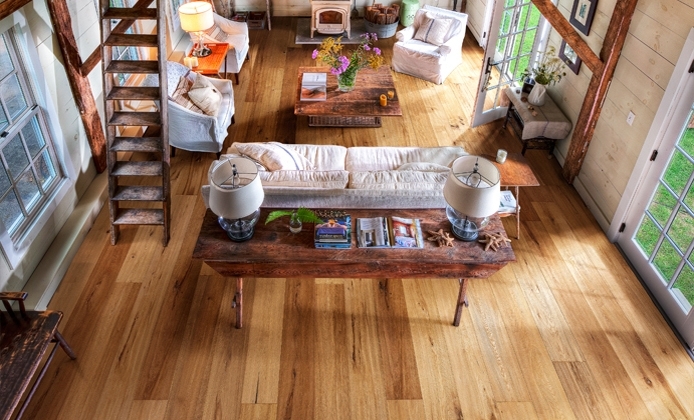 Go from Natural Floor Finish back to the Homepage.